_MAL2204.jpg, originally uploaded by Michael A. Lowry. 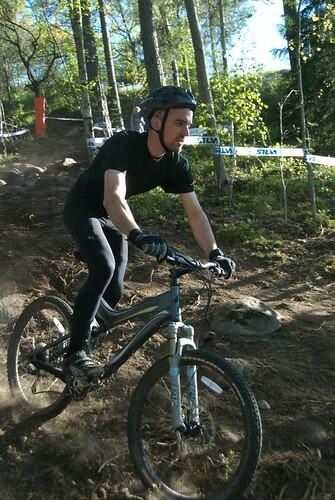 Today I joined Patric for a bit of downhill biking on the lovely island of Ekerö, just West of Drottningholm. We had a blast and I posted 64 great photos from the day. We biked at Ekerö Bike Park, using the ski lift to ride to the top, and then riding down on a narrow trail that snaked through the woods. I was really impressed by the number of talented riders on the trail. A girl named Lina was there too, and she was faster than many of the guys! You go, girl! The trail was a bit steep in a few places, and I noticed that I had a tendency to tilt forward over the handlebars. I lowered my bike seat as far as it would go, but it was still to high and I wasn't able to get my body low enough to ride the steep sections safely. The design of my bike makes it impossible to lower the seat beyond a certain point, because the rear shock absorber is in the way. After a few frustrating runs, I ended up sawing off a few inches from my seat post. There was a little workshop at the bottom of the slope, and I was able to use their hacksaw and metal file to shorten the seat post. After lowering the saddle a bit, I had a lot more control on the hill. Next time I'll take a few more inches off the seat post. I think I'll also try with regular flat pedals instead of SPD pedals. SPD pedals are great for uphill and cross-country riding, but they're a bit too confining for fast downhill runs. It's nice to be able to put one's foot down when sliding around a steep turn, and clip-in pedals make that difficult. Finally, I need to get some pads! I dared not go fast, because I wasn't wearing any protection aside from my helmet. Oh, that reminds me — I need to chat with the folks at Specialized and see what can be done about my “Deviant” full-face helmet. After just a few rides with the new helmet, the inside part came unglued from the shell. Very odd. Today's ride was a lot of fun, and I look forward to going back to Ekerö soon! For discussion about today's ride (in Swedish), visit happymtb.org.